Microsoft has scheduled a major event for the morning of October 6th, with a number of new Lumia devices expected to be announced. Among them, the rumors go, is one Lumia 950 XL, code-named Cityman. Microsoft's long overdue flagship device, supposedly, and the smartphone that we'll look up to to get a grasp of Windows 10's practical capabilities in the coming year. Having been so long since we last had a Windows-based smartphone worth talking about, we thought it's the perfect time to check with you and see if you guys are excited for what Microsoft is allegedly cooking. So we asked yesterday. And nearly two thousand of you responded. Some 44% of participants noted that they're very excited about the prospect of a high-end Lumia phone with Windows 10, followed by the second largest single group that say they are intrigued, with 31.16%. On the other end of the spectrum, 15.6% of voters are quite indifferent to any products resulting from Microsoft's work (not at all excited), while 9.23% say they're not really intrigued, but obviously not completing disregarding the possibility that the Redmond-based company could surprise us all. 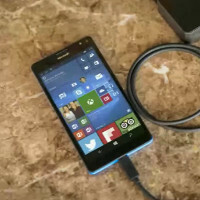 Are you excited about the prospect of a high-end Microsoft Lumia phone with Windows 10? Do you reckon Microsoft has something truly great under wraps? excited is not enough: will they buy it? If it's just another phone with a different OS - no. If it's a phone with the best camera - probably not. What will make or break it is Continuum. If Microsoft can truly break down the walls between PC stuff and phone stuff (and, even, console stuff) I think they'll have the start to a winner. yes. i will. but i'm just one of maybe 70-100 million wp users. I don't think if PC games need support from Microsoft PC games are way better than console ones and Microsoft don't really make that much games either. There was also promise of Xbox games be playable with PC but still PC got games got it's own big developers. While windows isn't really for me, I welcome the competition to the market with open arms. It will be exciting to see what new ideas they have :-) I wish them the best. I agree that more competition is better for consumer. For some, it might be a good fit. For me, I can only choose either iOS or Android as it lack key apps such as my online broker, my country weather and transport forecast information only available thru iOS and Android apps. My own company services app. Microsoft are also busy making apps for iOS and Android so I feel safer to bet on the right horse which is not WP. The only thing thats stopping me in buying a WP, is the lack of apps. I also hope in the future that there's gonna be more customization in the Ui. How so more customization of the UI? Windows is more customizable than Android or iOS? To be fair, Android's UI is more customizable with all the different launchers and whatnot, however the quality of many are lacking and some are malicious or have ads baked in. But the launcher doesn't make Android more efficient or less laggy. The efficiency and smoothness of Windows Phone is unsurpassed. If they come up with a really good design then it'd totally be a beautiful beast! I just use whatever that is available. I think Microsoft also realised that they must make good apps for rival platform especially Android. Forking Android could be a viable plan B.
I don't think forking Android is a plan B. They aren't going to ditch Windows, but they realized that the best approach for them is to not discriminate between platforms, so they are trying to get their services available everywhere. Good for everyone! Except the group that spend money on Microsoft dead technology believing that Microsoft has unlimited resources and would hold out for minority. I already piss with them for ending GFWL not going to fall for another of their pitfall. I also had two windows phone 7. they were great. But I eventually got bored of stuff not working and finally being discontinued: Zune, the Facebook integration in the people hub,... And finally them not being updated to windows phone 8 was what made me quit it. I'm happy with Android, eve if I still think that Windows Phone had a great user experience, at least less convoluted than the one on Android. Android is diversity. Could be good could be bad. Anyway, i am bored so i moving to iPhone 6s plus. Yeah the hubs and integrations were one of the big draws, but they're moving away from a lot of that in favor of individual services like the other platforms. If you're not competitive with the other platforms in individual services (apps), that seems like a pretty poor strategic decision. black bezel when not matching phone's color is absurd and out of date. The color of bezel must be the color of the phone or lighter. They will come to this... eventually. Those black bezels results in perfect sun light legibility so it write worth it. I'm just going to wait until my phone gets updated to windows 10. If T-Mo decides to update my phone. Because they are horrible at windows phone updates. Just get a developers account and get preview for developers, it will deliver Windows 10 to your phone when it is released, however you still will have to wait for firmware to be pushed out by T-Mobile, all software updates can bypass carriers with little effort on your part. I want a 6" pc running wimdows 10 with a phone in it and hdmi out. Who needs apps when one can have a full pc. I have an 8" Asus Vivo Tab Note 8. It works great. I just wish it were a little smaller with a phone in it. 6 or 7" would be perfect with an Atom processor, 4 Gb of ram 64 or 128 Gb of storage, an SD card, aType C USB connector, hdmi out, a fantastic screen, and a stylus. HDMI port is pretty bulky and i think type c port was maded to replace it some how.